In order to determine whether a person is infected with Mycobacterium tuberculosis, the Mantoux tuberculin skin test (TST) remains the standard method worldwide. This test is a common precautionary measure to screen the teachers, health care professionals and international travelers for tuberculosis (TB). However, reliable administration and reading of the TST requires standardization of procedures, training, supervision, and practice. It is performed by intradermally injecting 0.1 ml of tuberculin purified protein derivative (PPD) into the inner surface of the forearm. The injection should be made with a tuberculin syringe, with the needle bevel facing upward and inserted as a precise angle and in to depth in the arm to successfully test for TB. A team of researchers from University of Washington has created a patch with tiny, biodegradable needles that can penetrate the skin and precisely deliver a tuberculosis test. 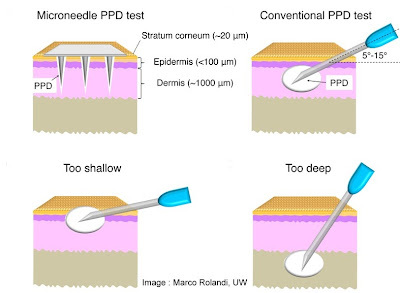 Since the depth of delivery is determined by the length of microneedle, rather than the needle-insertion angle, there is little room for individual user error. This test method is painless and relatively easier to administer.